Hungry Hyaena: Jumping The Gun? One of the labs at Rockefeller University has isolated a protein found in some species of insect that is responsible for the insect's sense of smell. 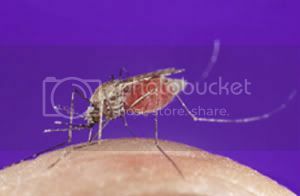 Removing or deadening this protein would make pest insects, such as the malaria-carrying mosquito (Anopheles gambiae), less likely to locate their food and, therefore, less likely to spread disease or destroy crops.